Retro lampshades come in a variety of distinctive styles and can feature patterns that are easily recognizable of being from the same era. Retro style refers to the designs that were popular during the 1950s, 1960s and 1970s. One common style of lampshade from the 1950s has whip-stitched lacing along the top and bottom edges of the shade. The shades come in shapes such as round, rectangle, oval and square. A unique feature of these types of shades is that they can also be multi-tiered. Multi-tiered shades are sometimes referred to as "double-decker", "triple-decker" and "birthday cake" shades. These shades can also be reversed, also known as "upside down" shades, which look great when hung as a pendant light over the dining room table. "Atomic" lampshades are another term for retro shades that come from the 1950s, a time when new technology in science, bombs, rockets and space exploration was in full swing. It was a time of eclectic designs and experimental, new materials. One of the amazing new materials that developed from the post-war era of the mid-20th century was fiberglass. Fiberglass is a common element found in insulation and was also used to make lampshades. Many lampshades in the late 1940s through the 1950s were made from a combination of fiberglass and resin parchment. 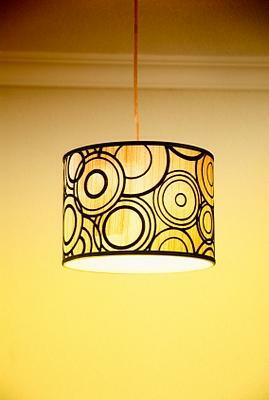 Drum style shades are also common retro lampshades. While the design might be very simple, drum lampshades come in a variety of retro patterns that are easily recognizable as being from the era of the 1950s, 1960s and 1970s. Retro style lampshades come in a variety of colors, however, what gives them their most distinguished look is often the pattern. The retro patterns from mid-century designers are sometimes referred to as "Jetsons-like", due to the space age craze of the time. If you remember the popular TV show, Bewitched, the animated credits that opened each episode had twinkling stars around the show's title that are iconic patterns for retro décor. A similar retro design was used in the opening title credits for the 21st century TV show, The Osbournes. The star-like designs surrounding the show's title are reminiscent of retro designs used 50 years earlier. A great place to see examples of retro style patterns is on Moon Shine Lamp and a Shades' Patterns page. This manufacturer of retro-style lamps has a great selection of vintage patterns for their retro lampshades. One of the most common patterns found on retro fiberglass lampshades is an abstract squiggly line pattern. This pattern appears as if someone just scribbled all over a lampshade or splattered paint all over it. Other popular retro patterns include geometric squares or circles in varying sizes and sweeping curved lines, similar to an elliptical orbit. Some patterns that are labeled "atomic" have little balls attached to the elliptical orbit lines, giving the impression of subatomic particles traveling along their orbits. Once your lampshade is assembled and you have dyed the shade in the color you prefer, you can add your own unique retro pattern and lamp base. If you're actually looking for an authentic vintage lampshade, not a newly made lampshade with a retro look, eBay would be the best online source for a collectible vintage lampshade that was actually made in the mid-1900s. You can also look for vintage lampshades in local antique stores, yard sales and your local thrift stores.